randform » Blog Archive » What is going on at the Sun? Why might this be interesting ? 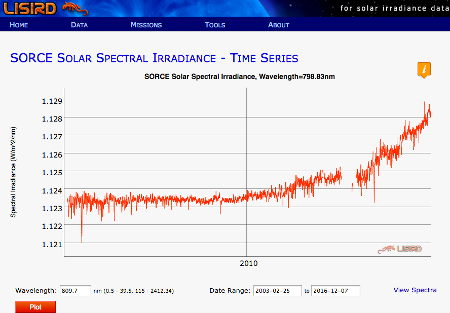 It is certainly important to understand whether the irradiance of the sun is getting stronger or not, decide yourself whether this makes the discussion of those issues interesting. 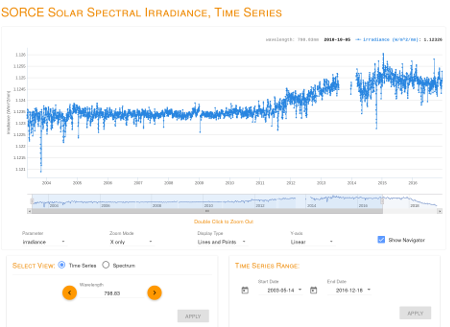 The historical total irradiance is usually reconstructed via sun spot activity and measurements are sought to be brought into accordance with those reconstructions. This should work fairly well if there are no major changes in how the sun is operating. It may though be less suitable if major changes would take place. 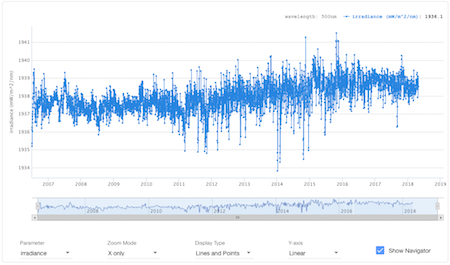 The sunspot activity is currently actually rather in decline, have a look at the American Relative Sunspot Number – Daily, Time Series . 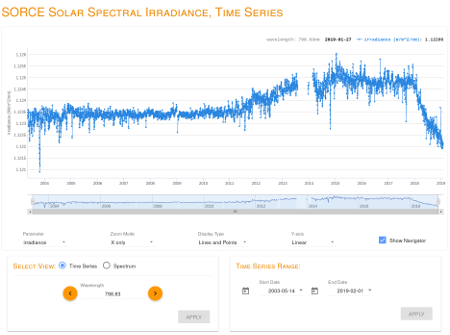 So accordingly a reconstructed time series like from Empire (please type in 797nm, I found no direct linking possibility) displays a reconstructed irradiance which is currently also rather in decline. 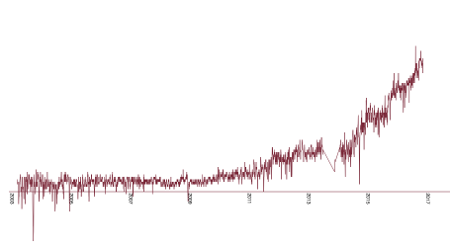 You can obseverve this for example by noting that the total irradiance in Feb. 2003 (i.e. a little after the last peak) is in the Empire series about the same as for the following peak in July 2014. This isn’t though in the SORCE measurement. There the peak in July 2014 seems on average higher than at the beginning of the measurement in Feb 2014 (as of today). What about that 798.83nm line? Specific line ranges might eventually be linked to certain nuclear processes in the sun. A discussion about this at Azimuth Forum. ….no further comment necessary, I think. So again my question to the randform audience: Do you know of any other direct irradiance measurements? Due to requests from commenters, here some additional info. 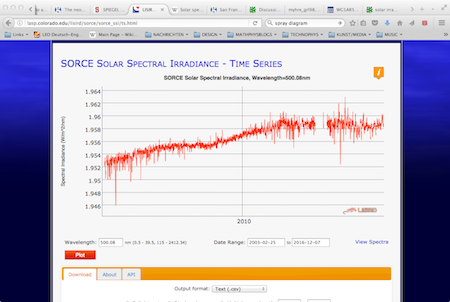 As far as I know the SORCE data is currently the only openly available off-earth spectral irradiance data, which covers the spectral ranges and time ranges (covering at least some years ) in question. I had written an email to the head of the world radiation center in Dec 2016 where I asked whether there are other data sets but got no answer. Swiss researchers are hoping for a mitigation of climate change: Sounds crazy, but solar radiation could mitigate global warming by up to 0.5°C. Researchers are now checking whether this is justified. There is one mission (also mentioned on the main LISIRD page) which provides spectral data from 265-500nm, the dutch OMI Spectral Irradiance. It looks more like the above mentioned uncorrected versions. Frankly – Instead of asking your audience about other measurements it’s rather you who should do a thorough research and present it here! Did you look at the document you linked to? SORCE was already on an extended mission so no wonder that it’s instruments were outdated. The above shows clearly that the SIM ( the spectral irradiance monitor) didn’t work properly anymore. I bet there are multiple other missions like the SORCE mission who deliver better and fresher measurements. The document even names a few ! Read page 4! There is: TSIS-1, TIMED, SDO (EVE), GOES EXIS. Please look yourself and don’t steel your readers time! I supplemented the post with some more info. Please have a look at this. Randform claims sun is sending more radiation but scientists say earth cools. What are you thinking – after billions of years sun suddenly changes in 2017? Many investigations have shown that the interaction of meteorological and ionospheric fields is most evident in the extratropical winter atmosphere (Danilov et al., 1987). The SORCE spacecraft was launched on January 25, 2003 on a Pegasus XL launch vehicle to provide NASA’s Earth Science Enterprise (ESE) with precise measurements of solar radiation. It launched into a 645 km, 40 degree orbit and is operated by the Laboratory for Atmospheric and Space Physics (LASP) at the University of Colorado (CU) in Boulder, Colorado, USA. The Aura spacecraft was designed for a six-year lifetime. The spacecraft orbits at 705 km in a sun-synchronous orbit (98o inclination) with a 1:45 PM ±15 minute equator crossing time. Aura limb instruments are all designed to observe roughly along the orbit plane. The MLS instrument is on the front of the spacecraft (the forward velocity direction) while HIRDLS , OMI , and TES instruments are mounted on the nadir side. OMI was built by Dutch Space and TNO Science & Industry (formerly TNO-TPD) in The Netherlands, in co-operation with Finnish subcontractors VTT and Patria Finavitec. The instrument was financed by the Netherlands Agency for Aerospace Programmes (NIVR) and the Finnish Meteorological Institute (FMI). whereas the spectral irradiance measurement instrument (SIM) was probably built by some of these people i.e. it seems to be an US project. 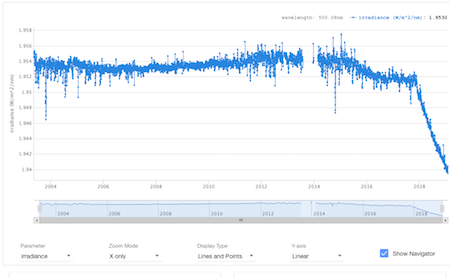 So two different spacecrafts in different heights and orbits with two different instruments measuring somewhat the same rise at 500nm over a couple of years. This doesn’t suggest to me that the rise is due to the influence of some cyclones or similar phenomena. Based on the total irradiation data I had said there could be a rise in total irradiation, but I had also pointed out that that this is just a very preliminary estimation, because amongst others it is not even clear whether my estimation “correctly” covered the whole sun cycle. Anyways the above are irradiation rises for certain spectral ranges only and not the total irradiance for all ranges. In principle these rises could eventually be even part of the sun cycles as some kind of fluctuation. I don’t know. It should however be said that the SORCE SIM measurements extend over the 11 year cycle. It may be hard to read in the above image but the SORCE measurement started 2003-05-14 so it covered roughly about 14 years until end of 2016. As far as I know the predictions of less total irradiation (and thus cooling) might eventually at least in part be due to an interpretation of sun spot activities. The sun spot activity is currently going down. So apriori the rise in the above spectral ranges could be part of a process which leads to a decline in sunspot activity. As a side remark in this context:: there were severe climatic changes in the northern hemisphere before and around the Maunder minimum which is suspected to be eventually connected to the Little Ice age. Are you sure you are allowed to post those screenshots? This might be a copyright infringement.